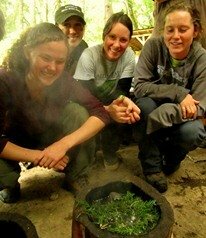 Week 14 of the Alderleaf Wilderness Certification Program (AWCP) was packed with all kinds of activities! 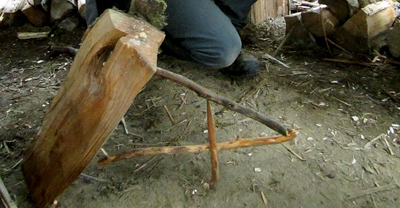 One cohort worked on wilderness survival snares, cordage, knots, and game processing while the other cohort continued their permaculture training with a variety of projects and presentations. Learning how to make cordage and tie knots is a very handy skill to have no matter where you spend your time, though in a survival situation, or in the back-country, these skills are essential and have countless uses. Instructor Jeremy teaching the students to make cordage using the reverse wrap technique with stinging nettle plant fibers. 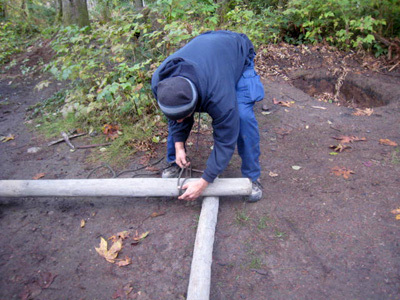 Here is an Alderleaf student demonstrating a common use of survival cordage - lashing poles together. Traps and snares can be an effective way to catch small game. Here's an example of a figure four trap which is very simple and effective. 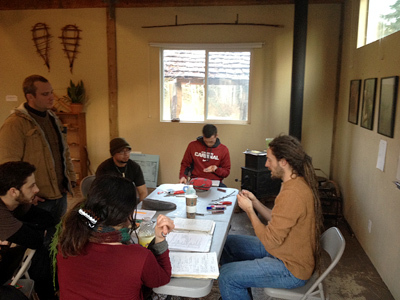 The focus for the other cohort this week was continuing to learn more about permaculture design. Students presented their personal projects and also learned about grafting, frost-seeding, and created roosting boxes for bats. 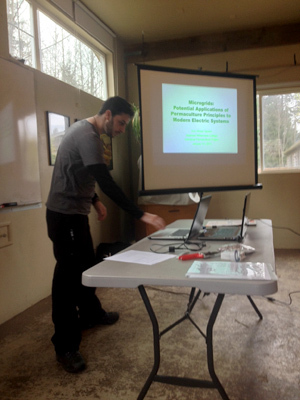 Here student Eric is giving his permaculture presentation on micro grids, which are small-scale versions of larger power grids that draw energy from clean sources such as the wind and sun. Permaculture instructor Dave teaches students how to do grafting - a great skill for fruit tree care. Finally to end the day students worked on making bat boxes to enhance wildlife habitat and encourage their "ecological services". Bats are amazing little creatures that have been given a bad name. One piece of the commonly stated misinformation is that bat are likely to fly in your hair and get stuck. Bats are incredibly agile and can avoid things not much thicker than a human hair even in complete darkness using echolocation. One of the benefits of having bats around is that they consume about 600-1,000 insects a night. Many of these insects may be damaging to our crops. Some bats in the southwestern United States also pollinate flowers such as agave and cactus, which supports our the reproduction of those plants. They also provide a great fertilizer that many people pay a lot of money for. Bat droppings (also called guano) are a rich natural fertilizer. 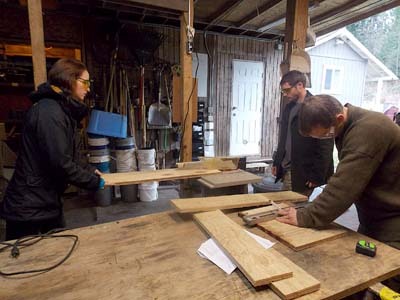 Here Alderleaf students Megan, Richard and Eric work together to cut and prepare the pieces of wood that will be put together to make a bat box. 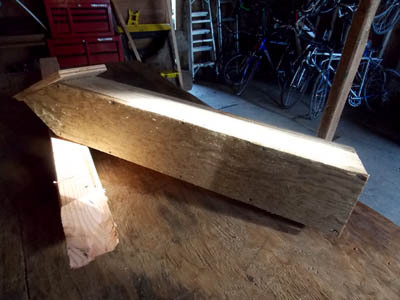 This bat box is nearing completion. It still needs to be painted a dark color to help it absorb more heat, and attached to a pole for placement on the land. Alderleaf farm looks forward to having more of these winged allies to help maintain the health of our gardens and forested landscape!